The five 289 Derby Community Design Events happened every Wednesday evening from May 24 – June 21. 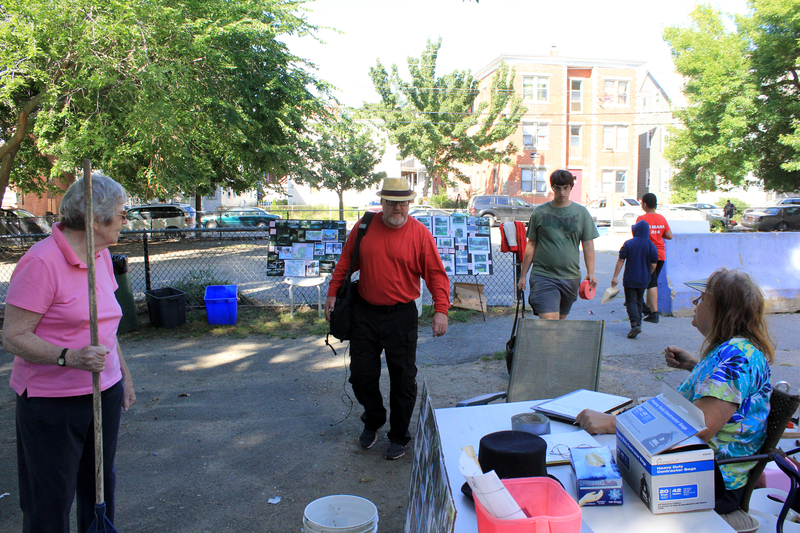 During the events, we collaboratively shaped the future of a new waterfront park – 289 Derby.The five 289 Derby Community Design Events happened every Wednesday evening from May 24 – June 21. During the events, we collaboratively shaped the future of a new waterfront park – 289 Derby. A lot of the creative input from the community was inspiring and useful as we all collaboratively created the design! The final event featured active engagement of the entire space. Since the “Curvilenear” plan was the overwhelming favorite, we drew the primary shape on the compacted asphalt so that people could see the proposed line between green and paved surfaces. We lined up chairs, tables, and design sections throughout the space, and people spread out across the lot in small groups. In the center of the space, we used the “Engagement Doors” to create a sculptural piece to be painted by participants. With the help of Creative Salem’s Kati Nalbandian and Joey Phoenix, participants painted the seasons on the doors inspired by the desire for a year-round space. 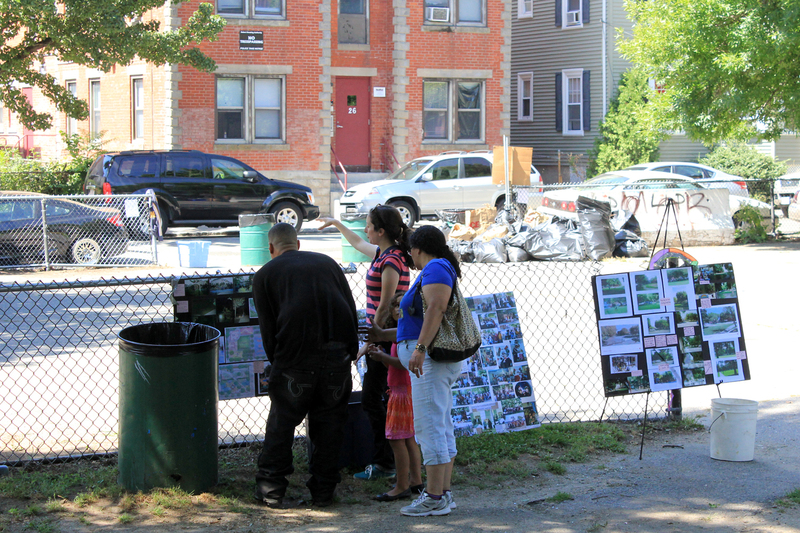 The final event felt like a block party, and people expressed satisfaction with the design proposal. Brothers Taverna serve delicious falafel, dolma – stuffed grape leaves, and hummus! Unlike the other events, the final was less structured. People walked the site, met with each other, ate food from Brothers Taverna, listened to local band, Model Citizens, and got close to the river when Coast to Coast paddleboarders came up for a visit. Coast to Coast Paddle paddled up from Forest River Park! Memento Magnates for Friends of 289 Derby – keep in touch! Inspecting and discussing the final schematic design! At the final event, one participant said they have enjoyed watching 289 Derby transform from an uneven parking lot into a place for community gathering. They noted the timeline: first the ground was evened, then murals livened up the brick wall, then we painted the colorful stumps for seating, then strung pinwheels on the water’s edge, and now – at the final event – the space is filled with groups of people here and there, chatting, sitting, looking over the favorite plan design, in the shade of a tree, watching kids paint, looking out at the water. 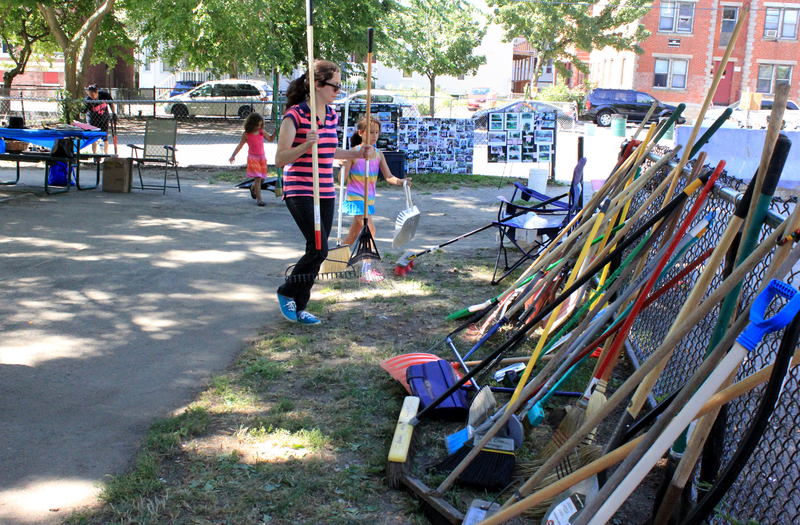 Using the whole space, we had a great placemaking and community design party! The Community Engagement facilitated by Salem Public Space Project and Creative Salem resulted in community buy-in and enthusiasm for the collaborative design and stewardship of a the new waterfront park. It’s meaningful that the transformation of 289 Derby was a local effort that showcased the varied talent in our small city, and the strong passion for community. 2. We created the types of events that could actually happen on site – from an outdoor movie, to dancing, to paddle-boarding in the South River – and helped collectively imagine the possibilities. 3. The above efforts inspired interest in local stewardship of some key elements of the park and programming for 289 Derby. CBA Landscape Architects further developed the “curvy” scheme for our final event. The schematic plan shows a balance between community desires: green space helps define paved surfaces, both flexible for varied activities. The design buffers the noise from Derby Street, and seeks to open to the water. The seating is both flexible, and integrated with the green space edge, and may hold some playful surprises. The green space is both peaceful with educational elements including demonstration garden with native plants for pollinators. These physical elements will help facilitate the desire for a safe, peaceful space connected to nature, and balanced with bustling community gatherings for performances and group exercise in the summer, and ice skating in the winter. With a budget of 750K from a state grant, the priority will be to create a beautiful, resilient container that will facilitate these varied desires – such as an amphitheater-like space, lawn with shade and trees, a multi-use stage, good lighting, a variety of areas for meetings, play, and chance encounters. A layer of creative elements will need to come in a later phase and/or through community partnerships. For our fourth Community Design Event, Eat & Imagine at 289 Derby, our goal was simple: involve everyone in choosing between two design schemes with Placemaking Placemats before enjoying some spontaneous eats on site. The varied activities people have envisioned for the space, from native permaculture gardens to winter ice-skating, would be possible in either configuration designed by CBA Landscape Architects. The simple distinction between the two plans is that one scheme is straight, and the other curvy. We thought we’d have some debate and close calls about which way to go, so we created “Consensus” placemats at each table. They were unnecessary! At a ratio of 8 to 10, the “curvy” plan was the clear favorite! There were many reasons for this. The primary factor was that it would be a unique form in Salem and people were attracted to the soft edges. The undulating paved space shows two discrete areas for flexible activities – one in the center of the space surrounded by greenery, and the other closer to the water with amphitheater-like integrated seating and a stage area that can double as a labyrinth for walking meditation during the summer, and even and ice-skating rink in the winter. The green space is similarly well suited to facilitate the multiple types of green space desired by participants: botanical gardens with plants for pollinators and native species in some areas, and lawn space with shade and seating in other zones. Together, these discrete elements facilitate layered uses to incorporate a surprising amount of the community suggestions we’ve gathered over the past five weeks of engagement. A big thank you to Bambolina for the delicious menu! Through the “Placemaking Placemats” we all participated in a design charrette. We collected 88 in total! Check out some of the votes on favorite Amenities and Activities – as well corresponding locations! 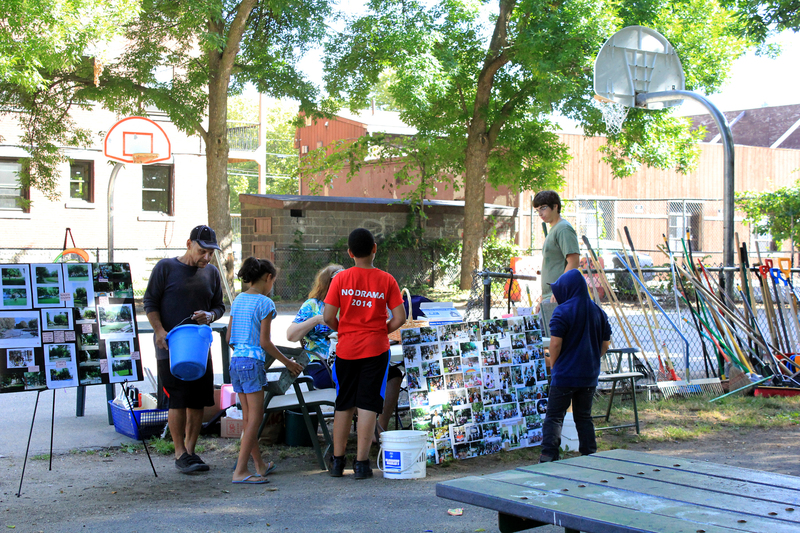 A big thank you to Salem GreenSpace and the YMCA for talking urban agriculture, permaculture, and community – and giving out tomato seedlings!! Design Trivia! The name for a gathering of people under pressure to design together, usually in an academic setting, is called a “Design Charette.” Charette is the French word for cart. Traditionally, fervent design students were said to still be finishing their drawings on the cart (charrette) as it was rolled down the hall to be reviewed. Now that we have a direction for both form and program, we still have a lot of work to do! Who will be those critical community partners to steward this space in a way that keeps it safe, clean, and inclusive to all? Creative Salem has compiled a wonderful narrative of the past 4 weeks – take a look and come see the schematic design unveiling with us June 21 at 6pm! Imagine 289 Derby from Creative Salem on Vimeo. This is part 2 of 5 posts documenting the Community Engagement Process for a new public space at 289 Derby. The City of Salem, Salem Public Space Project and Creative Salem welcome the community to participate in an exciting and innovative approach to placemaking. After a public process, CBA Landscape Architects of Cambridge became the primary designers with Salem Public Space Project and Creative Salem working as local leaders tasked with managing the community engagement / schematic design for the parcel. On May 31, dozens of people representing 22 local organizations gathered at 289 Derby for a deeper discussion for what this new waterfront public space should be. We sat and stood around a very large table and discussed the priorities of each person through the lens of their organization, or group they felt they represented, such as neighborhood associations, young families, or the nearby Derby Lofts. After Dance&Design at 289 Derby, the favorite idea was a “botanical garden with open space for education, music, and dance.” Ultimately, this statement, which received a majority votes in our Week 1 online and on-site surveys, speaks primarily to the desire for an engaging green space integrated with space for programmed, communal gathering. The need for this 1 acre spot of land to serve many needs, and still function as a beautiful space with a clear identity continued during our second Community Design Event: Meet&Share. A lot of the comments and desires were ultimately for spaces and elements that have multiple uses and appeal to multiple people of all ages, ethnicities, and abilities. For instance, some participants did not want another playground. However, many supported integrating an engaging sculpture that could be climbed by kids as well as start conversations with adults as a desirable design solution to multiple competing interests. Point Neighborhood Association: a place for community meetings and bridging across the water! Many expressed desires to connect – by continuing the Harborwalk around the South River, by connecting across the river to Peabody Street Park, and The Point neighborhood, by opening up access to the water, and by designing elements to facilitate social interactions. Salem Historical Society: make it beautiful with a covered eating area and a micro – forest! We became more specific about what sort of green space and what types of gatherings could happen at 289 Derby. Participants expressed a desire for resilient and sustainable vegetation that could even involve permaculture including passive food producing plants. We discussed maintenance and somehow getting local support to steward the space. Perhaps this could double with a vertical garden for pollinators, or a green buffer to mitigate the gasoline smell on the west side of the lot, or to buffer against the noise from Derby Street on the north. In fact, the green buffer could perhaps help dampen the noise on site too since people want a space for quiet contemplation. Many were drawn to the image of a labyrinth that integrates paving with greenery. In fact, this image represents the desire of many to integrate nature with community gathering: “Plants mixed in with sculptural elements” and “Greenspace interspersed with gathering space.” The circular flat space of a labyrinth could help facilitate different activities: a place for quiet walking meditation, a focal point for an amphitheater for theatre or music, a space to lead a yoga class, and a small ice-skating rink in the winter. Gathering in a beautiful space with green on one side and the water on the other is how many participants want to exercise, especially important for people of all ages. Derby Lofts: Make it Green! Well lit, safe and pretty and quiet! – an Urbane Oasis! Young families: gather + eat, gather +watch, perform or teach, traverse! Most participants expressed a desire to connect to the water, through an actual kayak and paddleboard launch, or by having a beautiful fence from which to lean and peer out. Bow Seat Ocean Awareness Programs: eco-friendly, low-impact on environment – vertical gardens! mural on National Grid building! Most participants also want a space for backyard type games, outdoor spaces for learning and gathering, and performances that aren’t too loud. The noise factor was one area of disagreement. Many expressed a desire for seeing music and performances with the water as backdrop, while others are concerned with the noise. Integrate nature with seating, art, and events for all! Many participants expressed a desire for an urban oasis of green where they can rejuvenate since Derby Street lacks green up to the Maritime Center. People would like to contemplate nature, perhaps understand native plants or how a rain garden works. Many suggested using art as a way to start conversations. One participant thought having permanent questions could stimulate discussions – indeed the simple chalkboard wall on site has done just that for a couple weeks! Some participants reached across the river and suggested that art can improve the look of the National Grid station by weaving through the fence, or painting a mural, or using artful light. Thoughtful and creative lighting was a big item! As was having a water-bottle filling station and other amenities such as an on-site calendar of events and a solar-powered phone charging station. Overall, the desire for some kind of green integrated with many types of gathering spaces and activities predominates. For our 3rd event – Play&Plan we will show three design options derived from what has been learned so far from our first two meetings, our chalkboard wall, and online surveys – Join us at 289 Derby from 5-8pm on June 7 for Yoga, play with B&S Fitness and Project Adventure, music play with Barbara Maitland! All are welcome! The Carnival Lot from across the South River – taken October 24, 2016 – in hyperactivity two weeks each year. The Salem City Council has some important Public Space business on the Agenda for tonight’s meeting (10/25 @ 7pm): 289 Derby Street (aka The Carnival Lot) could become one of the newest and most exciting Public Spaces in town. The Carnival Lot is named for the two weeks in October that it is used as a carnival – like right now! The otherwise empty parcel is the most significant Public Space Opportunity for the City of Salem in years. The $1.4 million acquisition of the lot appears affordable as a bond order and an annual payment through the Community Preservation Act (CPA) funding, roughly at 12.5% of the total CPA yearly capacity. View from Congress Street bridge shows the possibility to activate both the Harbor Walk and the South River. The Carnival Lot is a unique space in the city that can be a gathering space at the intersection of downtown, a thriving commercial corridor, the Point neighborhood, part of the Harbor Walk, and waterside access, all within a dense urban context. Unlike any other public space in Salem, the proportion of the space creates an ideal outdoor room. Up the road, Derby Square functions as our historic “living room.” The Carnival Lot is also defined by masonry buildings on two sides, but has the bustling activity of Derby Street at one pedestrian entrance, and the South River on the other to create the feel of a true urban “front porch” with unique uses, such as “Seaside Cinema” perhaps? The Carnival Lot is a crucial anchor space to facilitate the realization of the South River Harbor Walk as a complete loop that connects across neighborhoods and offers a unique connection to a waterway in the middle of our city. Without this space, the walkway will lack a space for gathering that will create a place, rather than only a walk. The lot offers a unique connection to the South River that symbolically (and perhaps literally!) can bridge across to one of our most dynamic and undervalued neighborhood, The Point. The lot as a public space can connect for water activities on the currently underused South River. The lot itself provides unique opportunities for pedestrian connections, much like the most endearing public spaces in the city from the Essex Street mall and the myriad alleys to the Ropes Mansion Garden to new trails (from rails), a unique pedestrian system of getting through the city enables the robust foot traffic that makes for active, safe, and useful spaces. We have the opportunity to truly “Still Make History” by creating one of the most beautiful, exciting, and dynamic river walks in the state. One of the most exciting aspects of acquiring The Carnival Lot is the potential for a genuine on-site, public process of what to do with it! Salem Public Space Project imagines great public gatherings exploring possibilities, experiments in the space with temporary notions, conversations about everyone’s ideas from stewardship and ecology to food-trucks and theater…. yes, we imagine and advocate an all-inclusive, all out, participatory process! 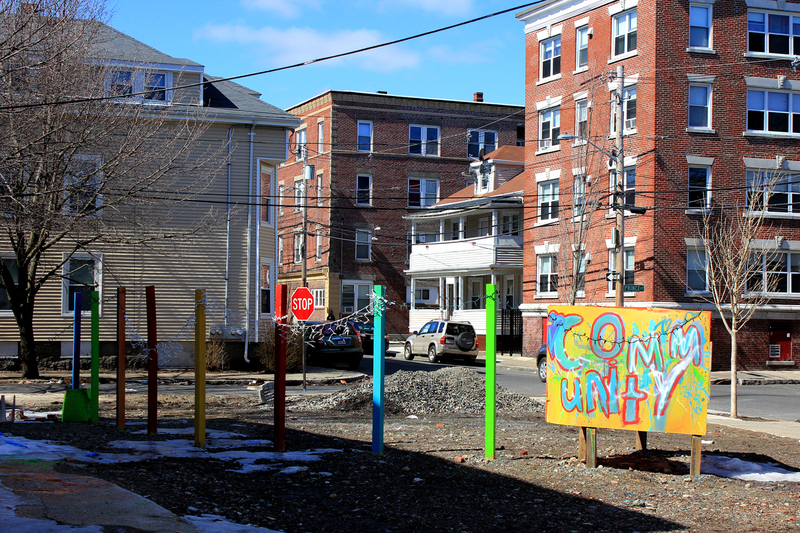 That is our dream and hope for The Carnival Lot: both its process of becoming and the gathering space we create together will constitute a beautiful and forward thinking legacy of urban design and public space in Salem. Off Derby Street, the public space can be a “front porch” for the city connecting downtown to the South River. From Flatbread to Notch, to new businesses across the street and river, the adjacent activity makes The Carnival Lot’s emptiness even more conspicuous. The alternative of an eventual built development (like condos, let’s say) would detract from the value of the location to the surrounding businesses, as well as the public. A novel, vital public space complements and adds real value to the existing and growing density. Write your Councilor if you support the Public Space Opportunity and / or attend the meeting at City Hall, tomorrow October 25 at 7pm. The City of Salem secured a $200,000 state grant to place a splashpad in one of its parks. 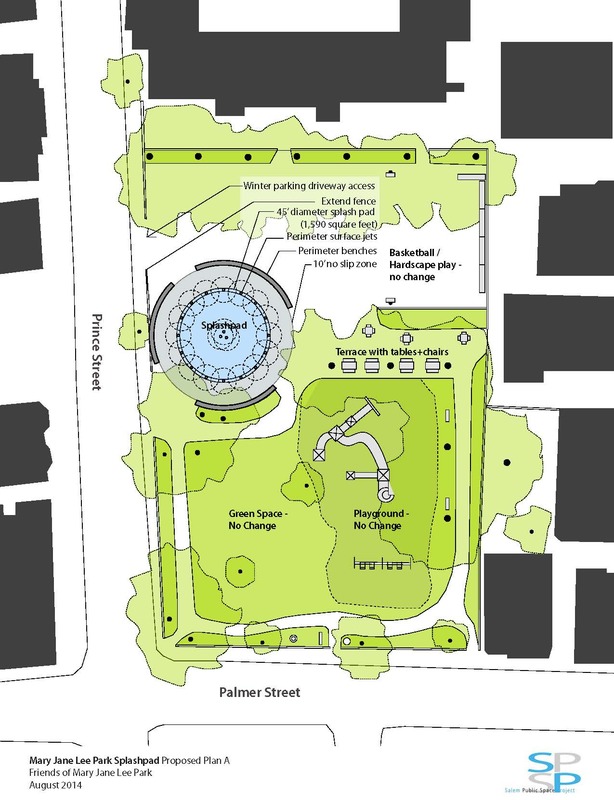 Having worked in the Point neighborhood through the Salem Public Space Project, and now affiliated with Friends of Mary Jane Lee Park, I am excited that the City has chosen Mary Jane Lee Park for the splashpad that has long been desired by residents. A wonderful prospect for the kids! This is one of the biggest public space investments in the Point neighborhood in many years. Unfortunately, the location of the new amenity comes at a great cost. Although the park is half greenspace and half asphalt, the City plans to locate the impermeable surface of the splashpad in place of the green-space. We, at Friends of Mary Jane Lee Park, propose it be located on the asphalt. Although the City has offered to recreate green space next spring, it cannot be as large as the current common green space. The current location reveals a mismanagement of resources: why tear up green space, only to relocate it later? In addition, the City Proposed location of the spalshpad will result in cutting down the mature evergreen tree. The plans stipulate the addition of more trees, but they do not replace a mature tree for its benefits to mitigating air pollution. With the current configuration, the park parcel is not large enough to include all of the planned (and welcome) activities by the City that include: Splashpad, Children Ride Track, Playground, Greenspace, and Parking. 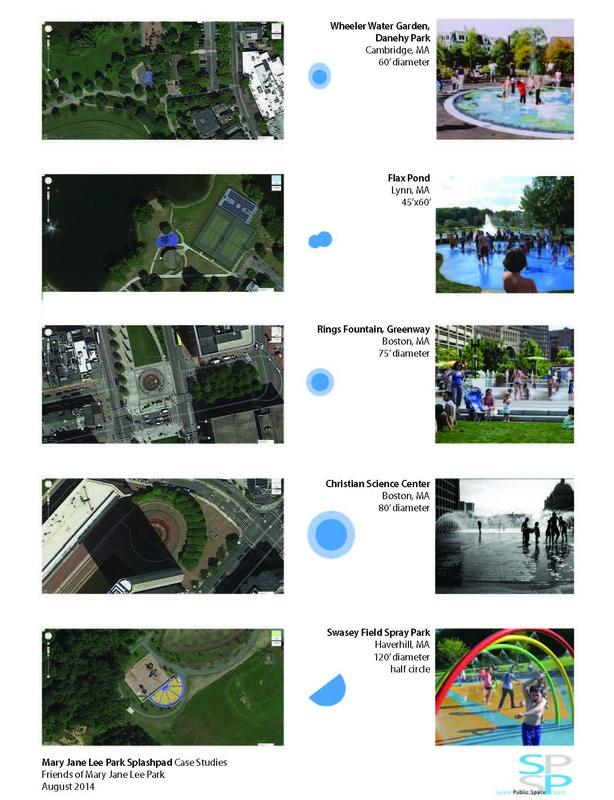 Our proposal can include all of these activities and the largest possible surface area of permeable green space. Furthermore, the splashpad will serve as water play three months out of the year – the rest it will be a concrete, impermeable surface. Friends of Mary Jane Lee Park have gathered over 250 signatures of residents that prefer we relocate the splashpad to keep the green space! The Point Visioning Plan, developed by a coalition of state, city, and neighborhood groups, stipulates that “greening” the Point is a top priority. Currently, the neighborhood has the least amount of distributed green space. 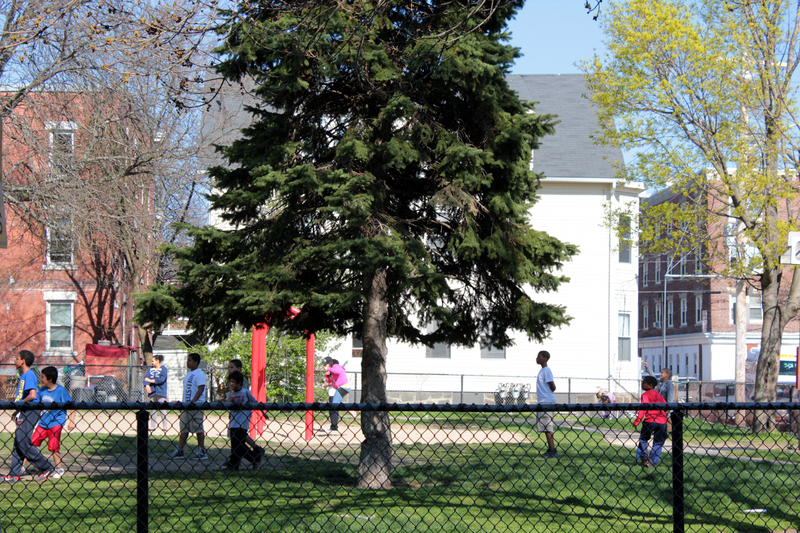 The neighborhood is four times as dense as the rest of Salem, and many residents don’t have outside space, front or back yards; they go to the park to enjoy green space. Despite meetings and emails, we have not been given any concrete reason as to how and why the proposed location was determined. The City asserts we need fast action as the splashpad needs to be completed by December or we can lose the funding! The first public meeting that showed the location was on July 28th. That was only about six weeks ago. There will be another public meeting next Tuesday. 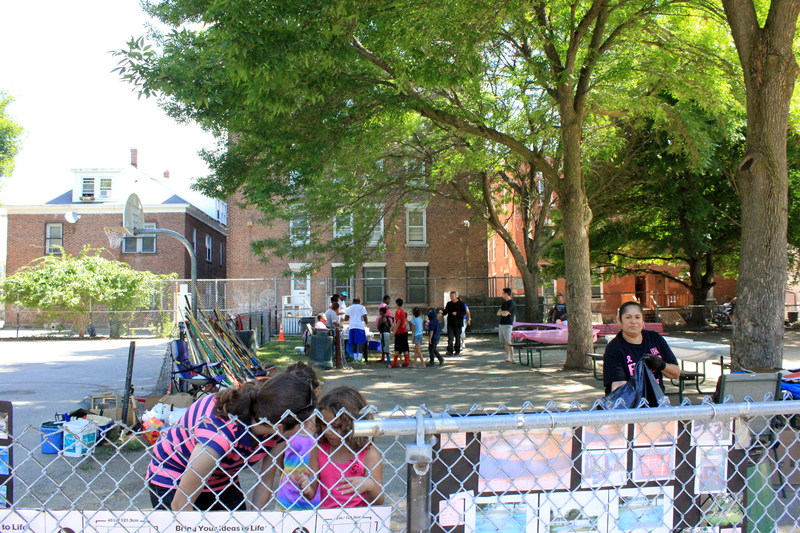 Come support the new splashpad amenity and maintaining green space in the Point! 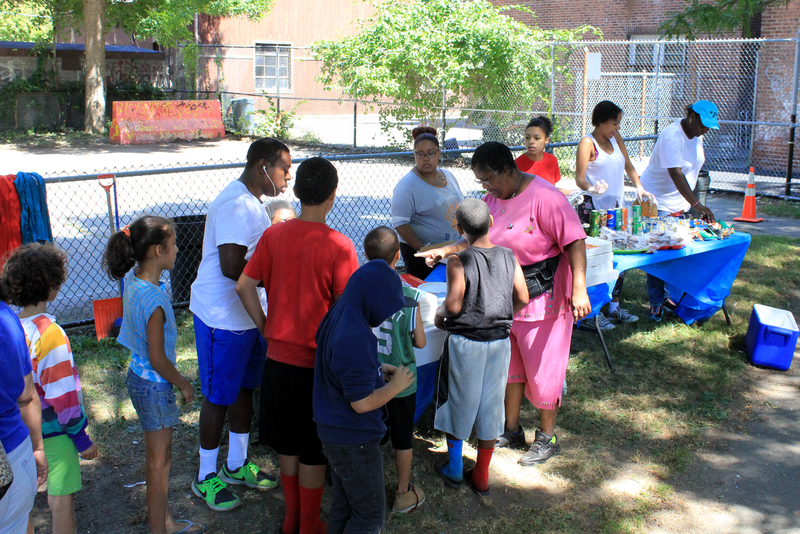 Saturday, August 30th, from nine to noon the community joined Friends of Mary Jane Lee Park and cleaned up the park! 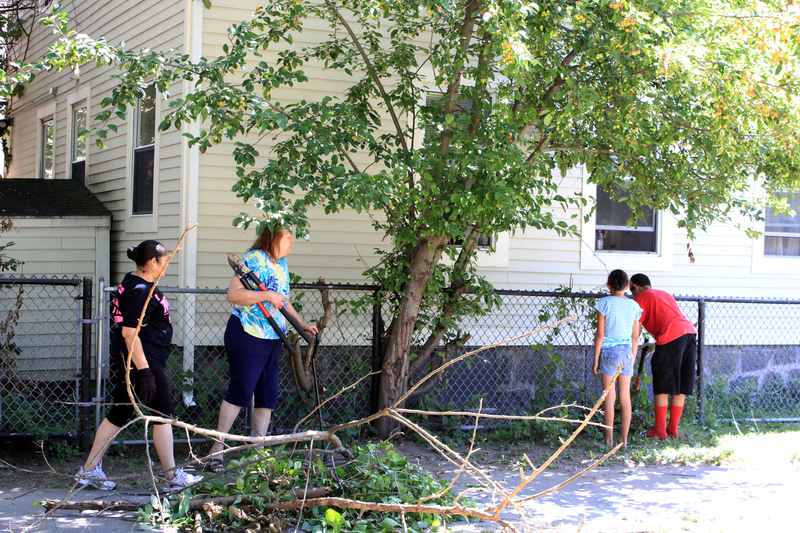 We sifted sand, removed graffiti, pulled weeds, raked grass, and of course, picked up trash. In addition to residents, we were joined by Councilpersons William Legault, at large, and Heather Famico, Ward 2. 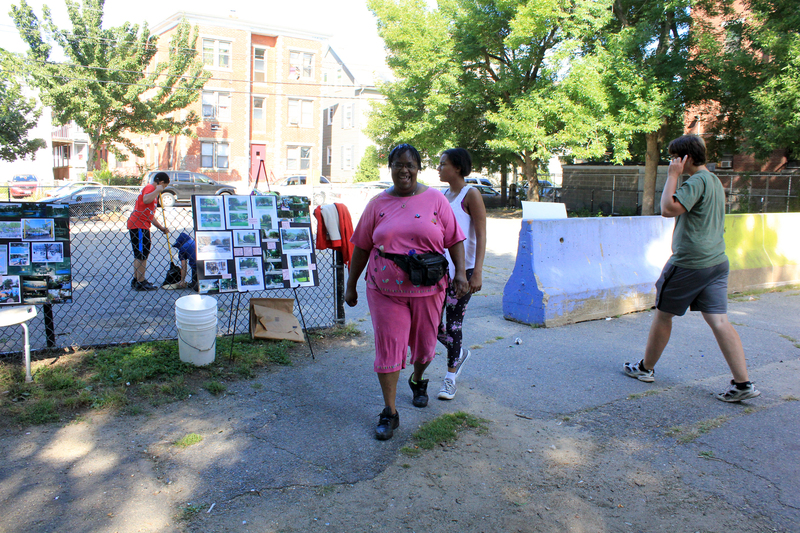 Some of the women of Friends of Mary Jane Lee Park, who organized the clean-up. After the clean-up, participants line up for pizza, juice, and cookies. Heather Famico, Ward 2 Councilwoman, was impressed with the cleaning efforts of her two young helpers! Sand sifting: sounds easier than it is! Nature needed a little trim too. 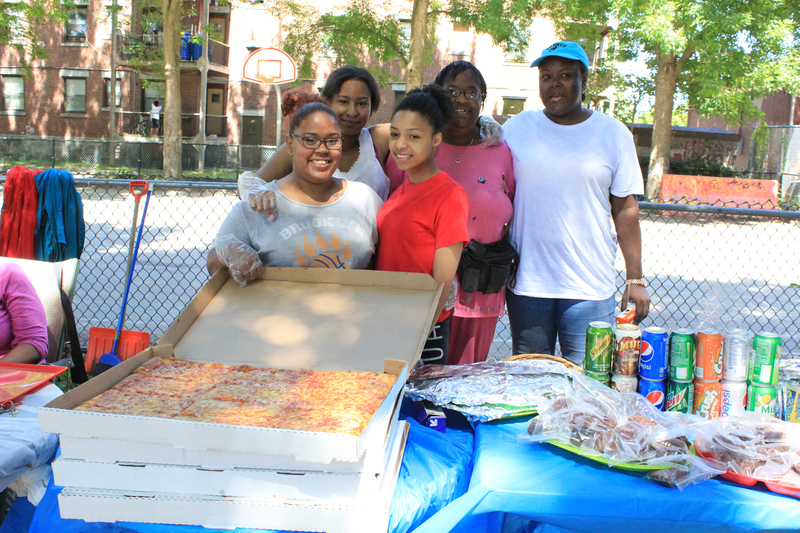 Doreen Thomas, president of Friends of Mary Jane Lee Park, sure knows how to orchestrate! Linda Locke, Friends of Mary Jane Lee Park, welcomes Councilman Bill Legault to the effort. Helpers, and posters, brooms galore. There was plenty of conversation too about the future of the park, especially since the City of Salem recently obtained a grant for a new splash-pad – a water based sculpture where children (and adults) will be able to play. You may have seen the Ring Fountain on the Boston Greenway that draws crowds on summer days. 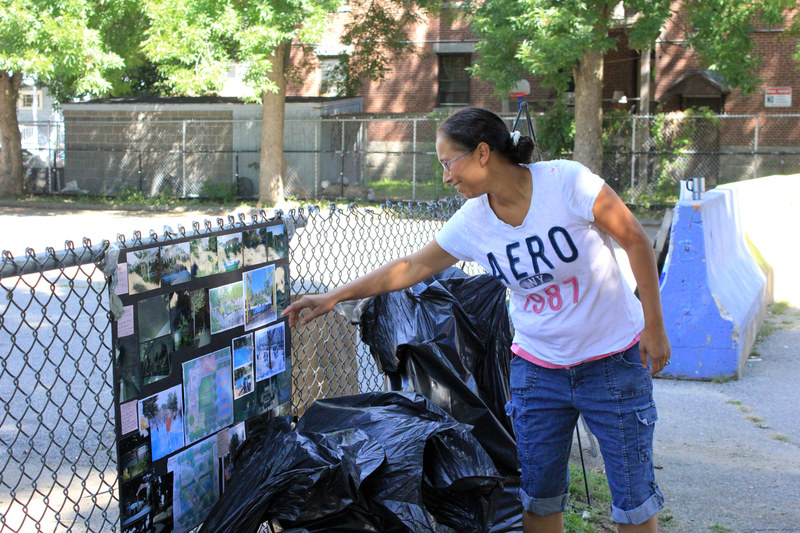 Residents have ideas about the shape and location of the welcome addition. Participants look at splash pad examples. Zena, Friends of Mary Jane Lee Park, points out her favorite spalsh pad in Albion Park, Somerville. Have you been to any of these splash-pads around Boston?